Need a small cup for those favourite snacks? Try our Ice Cream Cup. In addition to ice cream, the cup is also perfect for holding a variety of snacks – fresh fruits, small baked goods, candy, cheeses to name a few. The single-shelled carton cup can carry almost any small snack! Available in a variety of sizes, in a range of orders, and in a multitude of colours. Cups are custom printed to suit your needs. 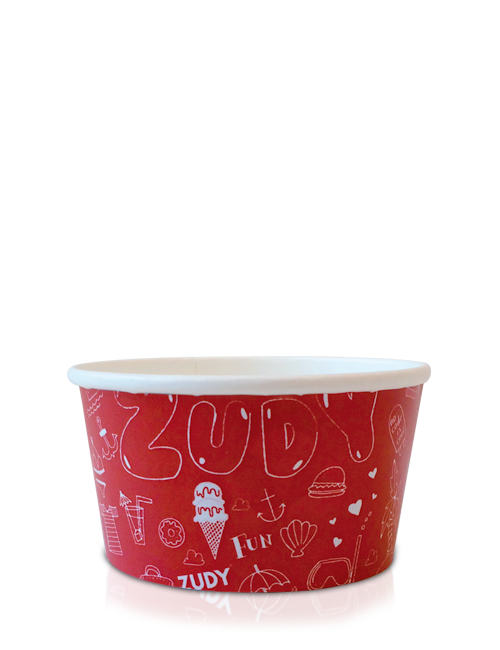 Plus, with our custom printing abilities, you can leverage the 8 oz Ice Cream Cup as an advertising vehicle. Add any unique branding features or logo to this custom printed ice cream cup to create a one-of-the-kind marketing channel. Our max resolution printing is top-of-the-line quality, food safe, and odourless. So, no matter what print option is best for your business, you know you are investing in high quality – nothing less. The 8 oz Ice Cream Cup is perfect for events, cafes, coffee shops, conferences, businesses, and others. The 230 ml Ice Cream Cup can also serve as a custom yoghurt cup. Mix and match your favourite treats! Delivered in just 14 working days! Contact us to start building your brand. Leverage our design team to create that perfectly printed Ice Cream Cup today. Why wait? We’re here to help. Give us a call today! For your individual Ice Cream Cup 8 oz design we provide you here our rectangular template as PDF for download.